With this development, it has become obvious to the world that Nigeria government cannot be able to deceive the world by placing a terrorist tag on IPOB worldwide with the obnoxious black market court order granted by Justice Abdul Kafarati, Chief Judge of Nigerian Federal High Court. 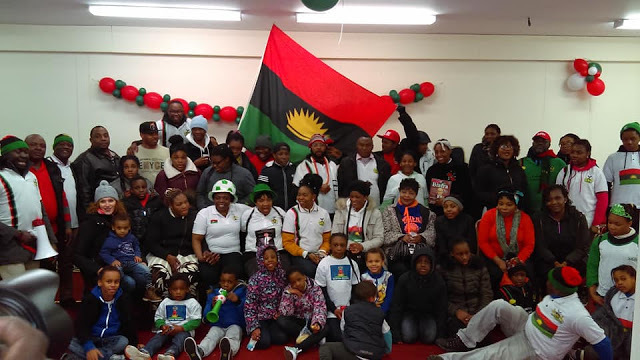 It could be recalled that the Indigenous People of Biafra (IPOB) worldwide ably led by Mazi Nnamdi Kanu, had endured all manners of provocations, killings, maiming and unlawful detention of her members in different places in Biafra Land and beyond, yet they remained undeterred in their peaceful process towards Biafra independence. It is on record that IPOB has never killed anybody, attack anyone or any of her members found anywhere in the world bearing arms. As the whole world have shown that they can still make right judgement by ranking of IPOB as the most peaceful freedom fighting organization no matter the pressures from Nigerian government on virtually all the institutions of the world through bribery to portray IPOB in a bad light, when will the world reciprocate the peaceful disposition of IPOB by supporting Biafra independence instead maintaining a criminal silence over the impunity of Nigerian government against the people of Biafra? Has IPOB not endured the brutalities of Nigerian government enough? The people of Biafra worldwide under the auspices of IPOB are under sacred oath to remain law abiding and stay away completely from all forms of crime in their journey to Biafra independence. Nigeria government has committed all sorts of atrocities against the people of Biafra as contained in the publication of the African Guardian website, yet IPOB members are being constrained to remain non violent due to the sacred oath which was administered to every member of IPOB before admission into membership. However, let not the world view this path of peaceful agitation by IPOB as weakness but the greatest strength of the people of Biafra who understood that violence is a wind that blows no person any good. IPOB want the world to understand that anybody or organization can easily cause violence as Nigerian government continued responding to the peaceful agitation of IPOB members with unwarranted violent clampdown via military siege, invasion and brutalities, but it is only the most courageous people like IPOB can vehemently insisted on peaceful agitation against all the provocations coming from Nigerian government in their crude way of responding to IPOB's peaceful agitation. The world must act now and save Africa from danger by compelling Nigeria government to respect international laws and protocols governing self-determination and allow Biafra independence to become reality. A stitch in time saves nine!